Why is this pink hat so hated? Fans say it's a fashion statement. Naysayers counter that anyone in a Sox cap this color is a poseur. Anne Houseman was never into baseball, but after moving here in 2002, she became a devoted Red Sox fan. 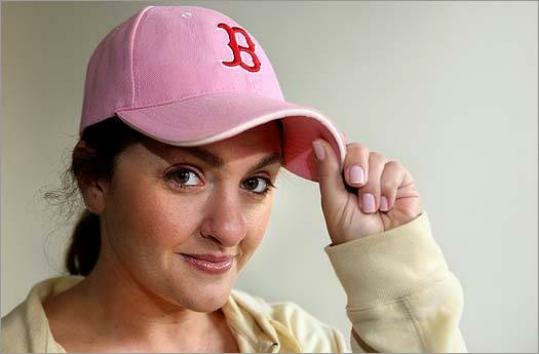 To pledge her allegiance to Red Sox Nation, she bought a pink Sox cap and wore it proudly around town and to Fenway Park. For a while, the convert shared a peaceful coexistence with lifelong Sox fans. But something changed in late 2004, after the Sox won the World Series. Houseman, 28, soon found her pink hat was about as welcome here as an A-Rod shirt in the bleachers. Rather than a sign of support, the pink hat somehow outed her as a poseur, a bandwagon fan. "I was watching a game on TV with a girlfriend of mine and the camera zoomed in on a female fan in a pink hat," she said. "My friend went on a five-minute tirade about pink hats and how people who wear them are not real fans." Later, Houseman threw her pink hat into the back of my closet. "I had no idea how unwelcome it was," she said. Next to Yankees caps and Giants jerseys, the pink Red Sox cap has become the most polarizing piece of clothing a Bostonian can wear. Fans of the hats think they're simply a cute way to show their love for the Sox. Haters say pink-hat owners are latecomers who only support the Sox because it's suddenly cool - even fashionable - to do so. Pink-hat wearers haven't suffered sufficiently, they reason. No one suffers in pink. If local sports blogs, fan sites, and talk radio are any indication, the sniping is approaching fever pitch, now that the Sox have two recent Series wins to their credit. Message boards at local sites like Barstool Sports fill up with vitriolic comments - most of which are unfit for publication - on both sides of the issue whenever pink hats are mentioned. And now, even new Celtics fans are dubbed "pink hats." "I believe this is the year that Red Sox fans - the pink-hats and the die-hards, who have been eyeing each other suspiciously for five years now - finally have it out with each other," Randolph native Eric Gillin recently wrote on the national sports blog Deadspin. "This is the season where what it really means to be a Red Sox fan finally bubbles to the surface." The squabbling is about more than fashion, clearly. It's about the gentrification of Fenway and rising ticket prices and chicken Caesar wraps where Fenway Franks once reigned, unchallenged. Fans in pink hats are just the icing on the cake. "When a team is winning, you're going to see more fans climbing aboard, creating more supply and demand," said Shawn McBride, vice president of sports marketing for Ketchum, a public relations firm. "It happened with the Patriots, it's happening now with the Celtics. But with the Red Sox, it's an even bigger phenomenon. It's not so much a bandwagon as a caravan." Don Martelli of Revere not only dislikes pink Sox hats, he thinks anyone who wears them should be banned from Fenway Park. "Pink is not a part of the Red Sox palette," he said. "And while we're at it, ban the green ones and the camouflage ones, too. Those aren't the team's colors." Martelli has banned pink hats and any other untraditional Red Sox garb from his own home, much to the dismay of his two young daughters, who love anything pink. "Am I saying everyone in a pink hat isn't a fan? Of course not," he said. "But in my experience at Fenway, whenever I see someone talking on a cellphone, not watching the game, it's usually someone in a pink hat or some other color." For some, it's not so much the pink hats as what they represent. In fact, the whole "nation" concept reminds some people of that other team. "I don't want us to become like the Yankees," said Matt Trocchio, 27, of Brighton. "When they were winning, you'd see people all over the country wearing Yankees hats and shirts. That's what I think about when I see pink hats. I hate that." Gillin believes that anti-pink hat sentiment is likely the result of an identity crisis, the growing pains of a fan base trying to redefine itself. "Some of the problem is the old calculus: To be a true Sox fan, you have to suffer. Generations of fans have to suffer. Now, as a winning team, we have to find a new way to suffer, and we're doing that by blowing small things - like the color of someone's hat - out of proportion," he says. Hierarchies are seen in most subcultures and Red Sox Nation is no exception, says Michael Ian Borer, a sociologist and author of the new book "Faithful to Fenway: Believing in Boston, Baseball, and America's Most Beloved Ballpark." Longtime fans may see themselves as the keepers of the flame. But the support of newer fans, he says, is just as valid. "The pink hats are simply another way of expressing one's devotion to the team, not a lesser devotion to the team," he said. "They're an article of faith, like the green hats for St. Patrick's Day, or the Puerto Rican or Dominican flags worn on some hats. All fans are different, so it makes sense that not everyone worships in the same way." Some believe that singling out pink hats for scrutiny is really about gender stereotypes, and speaks to bigger issues in the culture surrounding women and sports. Making assumptions about someone's devotion based on what she (or he) is wearing is just plain silly, they say. "I think everyone needs to take a deep breath and relax with regard to the whole pink hat thing," said Sara Faith Alterman, 28, an on-air personality with WFNX-FM (101.7) and correspondent with the Boston Phoenix. "If pink is your thing, then you should be able to support your team with pink. What's the big deal?" Maggie Magner, a lifelong Red Sox fan, started the web site GirlSoxNation.com specifically to quash the notion that women can't be both sports-savvy and feminine. "We were tired of all these stat-wielding bullies saying real fans don't wear pink. Who decides what a real fan is anyway?" Magner asked. "Women represent half of the ballpark attendance today and are buying more merchandise every year." Magner's site has taken heat for its "Pink Hats" section, which features discussions about ballpark fashion and invites readers to send in photos of themselves with Red Sox players. "We were dismayed to find on various blogs that people were 'skeptical' about the site because of the Pink Hats section," said Magner, who doesn't own a pink hat but says she reserves the right to buy one should the mood strike her. "It's meant to be fun and whimsical and is geared toward women fans who don't take the entertainment of baseball too seriously - even though they are real fans." Magner said she's taking the pink hat backlash as a challenge to support female fans of all hat colors. As for Anne Houseman, she's starting a backlash of her own: She's brought her pink hat out of retirement. "I like pink. I like the Red Sox," she says. "I'm going to put on my hat and wear it proudly." Discuss What do you think of pink Red Sox hats?